Boatyard restaurant is an upscale restaurant with a great laid-back nautical-meets-chic vibe. Expansive waterfront views are seen from almost anywhere. Beautiful yachts dot the background. 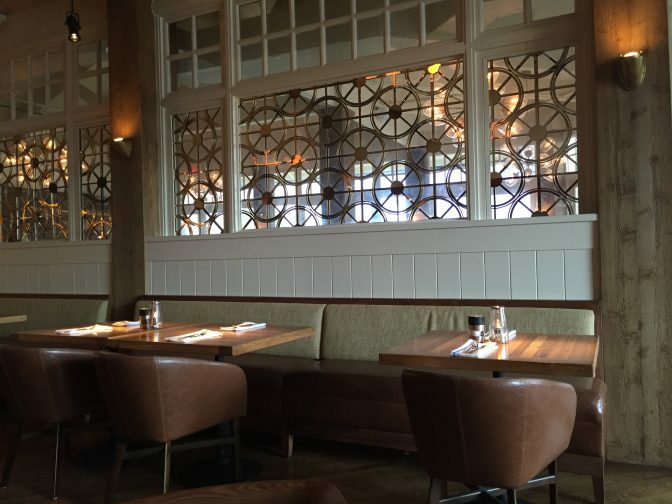 Restaurant patrons can enjoy meals inside, outside on the waterfront patio or even dockside. Boatyard embraces an “Eat local, Be Coastal” philosophy, which brings the freshest fish and shellfish to you. A raw bar and an open kitchen enhance the sophisticated feel of the restaurant. There is a full bar offering handcrafted cocktails and a reasonable & tastefully chosen wine selection. Though there was quite a crowd around the bar, the laid-back, sophisticated vibe of the Boatyard was evident. It was not noisy or overpowering, and we could chat comfortably. For our recent visit, our server Marco was very personable and knowledgeable about the menu. He is from Argentina, so we were able to ask lots of questions about Argentina. Happy to answer them, we can say that Argentina is now on our travel list! The menu at Boatyard is what I would call subdued sophistication. Take the Charred Octopus, which is boiled to make it tender and then charred to bring out the hidden tastes. 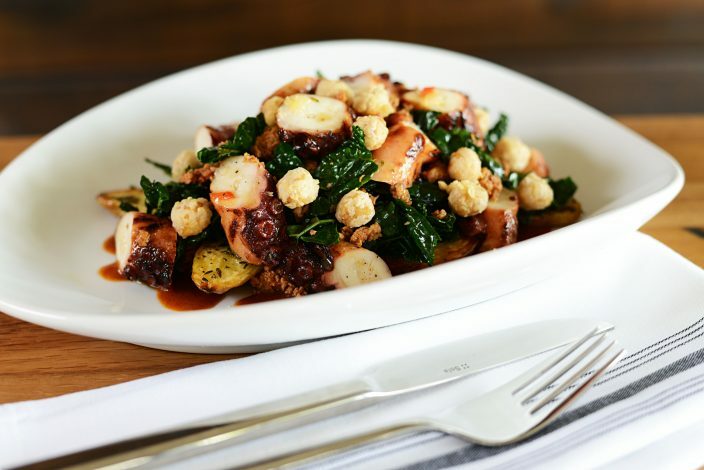 Pairing the octopus with wilted kale, garbanzo, and fingerling and topped with a chorizo vinaigrette this dish oozes a surprisingly sophisticated taste and feel. On Marco’s suggestion, Jim began with the “Soup of the Day”, a Tomato & Shrimp Bisque. It was very rustic, with chunks of tomato and shrimp in every bite and very flavorful. 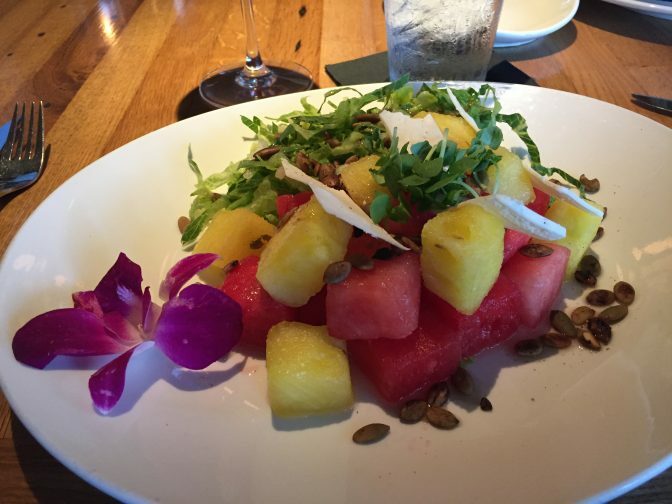 I chose the Watermelon Salad, a delightfully fresh combination of red and yellow watermelon pieces, toasted pepitas, Ricotta Salata, and lettuce garnish topped with a delicious rum vanilla vinaigrette. Both of these dishes are quite simple. But the pairing of the shrimp with the rustic tomato soup and the watermelon salad paired with the rum vanilla vinaigrette give a whimsical fun taste and a sophisticated feel. 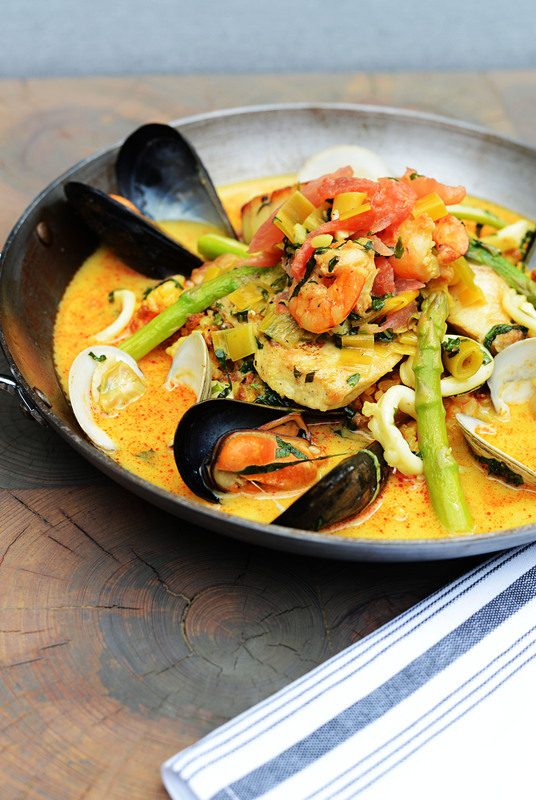 For our main courses, Jim opted for the Florida Paella, with shrimp, clams, mussels, calamari, local fish, saffron rice and house-made chorizo. It was not an enormous serving, but more than enough to fill you up. Cooked perfectly, each bite melting in your mouth, the flavors building and complementing each other, this dish was a joy to devour. The paella was a fun dish that transported Jim back to his travels through Spain. 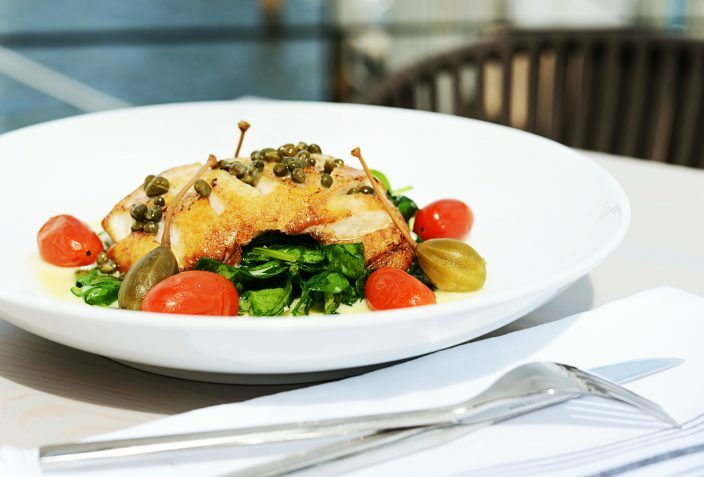 I chose the Grouper Piccata, served on a bed of wilted fresh spinach, garnished with cured tomato, caper berries, and lemon chardonnay butter sauce. The grouper was perfectly prepared, with the edges a bit crisp, but the center moist and delicious, not fishy at all. The lemon chardonnay butter sauce was very delicate and not overpowering but enhanced the natural flavor of the fish. One improvement on this dish was the saltiness of the spinach. Overall, this was a simple, sophisticated dish that was a delight to eat. Marco tempted us with desserts, but alas we had to pass. The dessert offerings are heavenly, however, ranging from a decadent S’Mores with home-made chocolate chip cookie topped with chocolate pudding, a toasted marshmallow and finished with raspberry sauce to a Tropical Tiramisu consisting of mango and passionfruit mascarpone mousse layered with rum sponge cake, and topped with pineapple-ginger caramel and bananas. I think one day we may go in and forgo dinner and have drinks and dessert! With a moderately high price, but a good price to value, Boatyard is quickly becoming one of our favorite eateries! Boatyard is quickly becoming a shining star in the Fort Lauderdale food scene, and if you find yourself in Fort Lauderdale anytime soon, I recommend you check it out. Using a 5 point scale, we rate Boatyard 5 stars! The food looks fantastic. Local seafood always seems to taste the best! Absolutely Connie! And it is fantastic! That watermelon salad looks so good! I’m making note on this restaurant as it looks like a winner. I’m always looking for good places to eat while traveling. Florida Paella for me, all the way and over and over! The charred octopus looks amazing! What a great find! Kristy Marrins – it was absolutely fabulous! The flavors were enhanced by the charring and it just melted in your mouth.